Anybody else having an issue with Saved games? When I select a saved game file to load, I get the message "Save game belongs to another player or is edited. Achievements will be disabled." Haven's seen any issue with saved games, so far. Are these cloud saves, or local? I could be wrong, but I don't think you can fabricate a claim on Normandie because it is currently a capital. Do you already have a claim on Caux? If so, then the box is correct in telling you that you have no more neighboring provinces in Normandie that you can fabricate a claim on. If not, then I am not sure why it won't at least be lit up so you can fabricate on Caux. Yep think that makes sense, thanks! 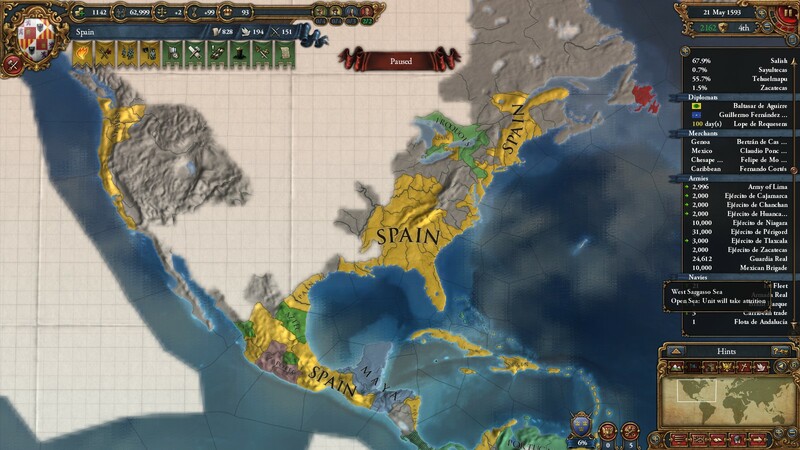 Well, last night was a bad night to be a Native American in my Ironman Spain game. 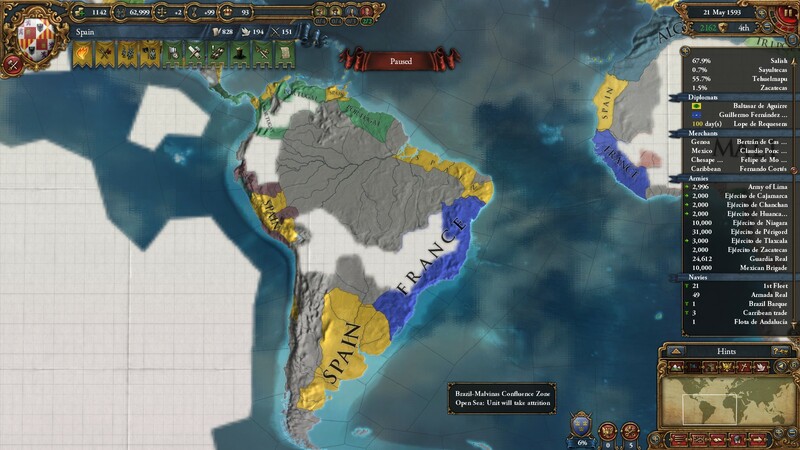 With the Aztec/Incan/Algerian/French coalition dissolved and France dealing with its newly freed provinces, I took the opportunity to romp around in the Americas. While the Incan/Aztec peace was still in place, I blitzed the Creek and annexed them. Next, I took down the Cherokee but only vassalized them because of my already high overextension. Next up on my hit list were the Shawnee whom I conquered and forced to give all their cores to my Cherokee vassals since the Cherokee already had cores on all the Shawnee territory (except Ohio) and my overextension was still high. I then immediately broke off my ties with the Maya, subjugated them in a quick war, and vassalized them. Next, I turned back to the Native American kingdoms in the north. I had been colonizing the American east coast during these wars and had met the Iroquois. I declared on them with my North American force and quickly conquered them and vassalized their lands. Examining their diplomacy screen uncovered that they had a reconquest casus belli on the neighboring Huron so like the benevolent leader that I am, I conquered the Huron for them and returned most of the Huron land to the Iroquois. To sum up, in 1580, the Iroquois and Maya are my vassals. The Cherokee are still also a vassal but the annexation process has started and the integration percentage is slowly ticking upwards. Over in Europe nothing much has changed. 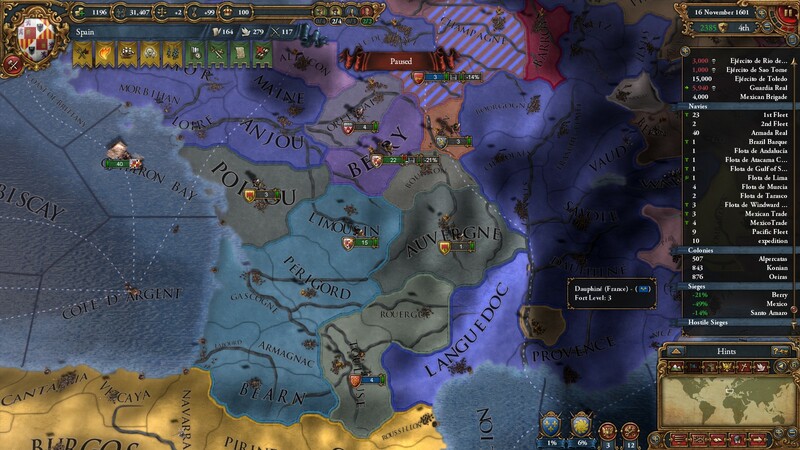 The French have reabsorbed Avignon and are once again fighting against HRE members so they have been leaving me alone. The only European conflict I've been involved with is one where my ally Britain was fighting a defensive war against the Irish but his main army was already busy in a large kerfuffle in Scandinavia so he called me in to help. So I shipped 15K troops to Ireland and pacified them. I've only ran into a couple of game oddities that I don't quite understand. I've been papal controller for several decades now and the extra diplomat has been very nice for my North American adventures because it takes diplomats 6 or 7 months to return from the new world. It is also helping in my annexation process of the Cherokee since annexation ties up a diplomat for years. However, the game won't let me use the "call for a crusade" power against the Ottomans because "they are too far away." This is even with me owning a territory in southern Italy and them owning territories up all the way to southeast Austria. I'm guessing it only looks at distances between capitals or for the existence of neighboring provinces? Second, I spent a long time influencing Sweden's opinion in order to ally up with them since they are best buds with my ally Britain. However, even when their opinion of me had improved to the point that they were willing and the red x had changed to a green checkmark, the alliance button was still grayed out. 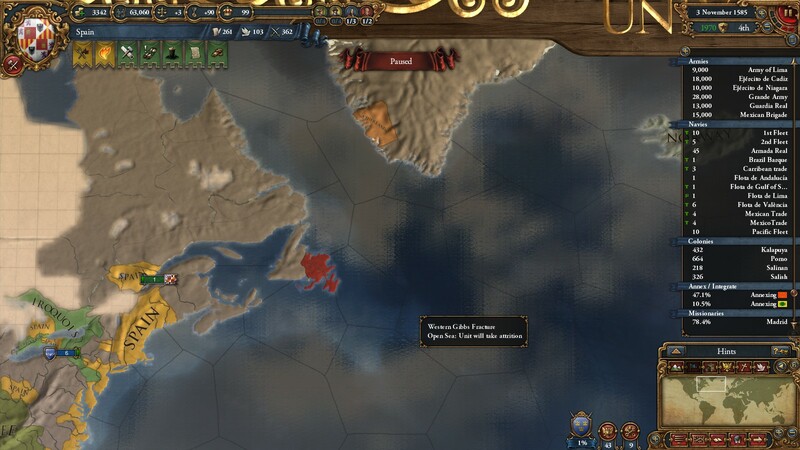 According to the tooltip, it is because MY people don't like the Swedes. I have no idea how to change this. 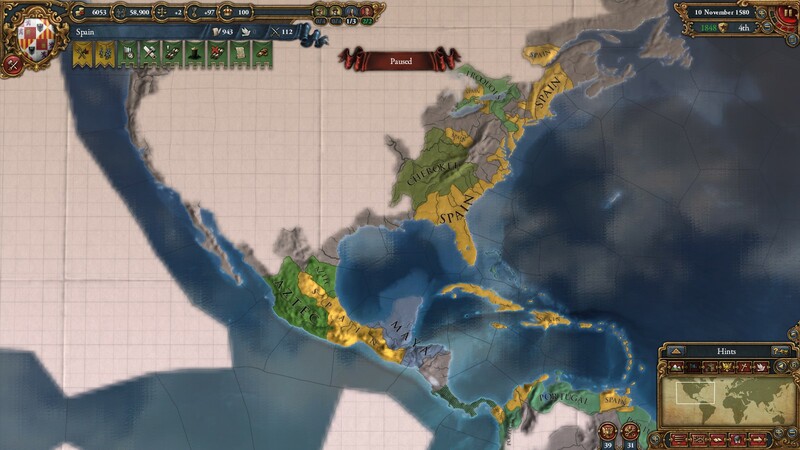 In the next session I am going to work on annexing my native vassals, taking more from the Incas and Aztecs, and colonizing the American west coast as my explorer found some rich provinces over there. My Caribbean trade node is now producing much more gold than Sevilla, and I have found it more advantageous to collect there instead of sending trade forward because of the higher competition in Sevilla and my near monopoly in the Caribbean. I've also sent my third merchant to collect from Chesapeake Bay as there is no way to steer that trade south to the Caribbean. 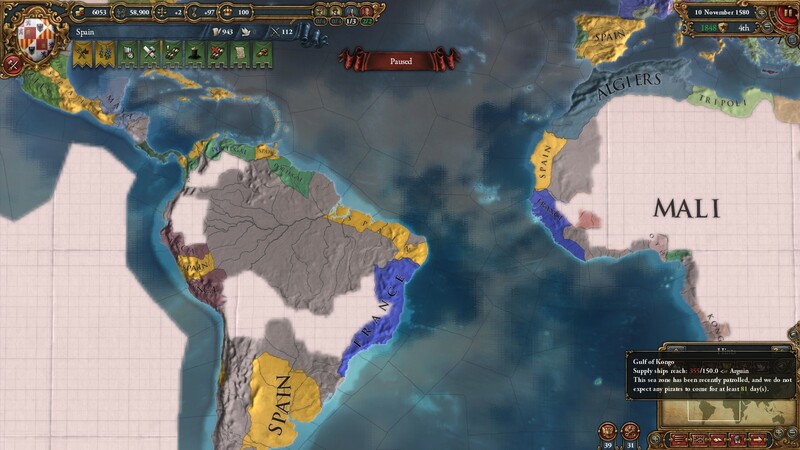 I would like to take Portugal's Caribbean territories to increase my trade dollars even more, but they are still allied with Britain, and I don't want to lose my British ally. This is one of those places ironman has really added hard choices. Chances are Britain wouldn't side with either of us and I could just attack Portugal without either of us losing or British ally, but I simply can't risk it. Even the small chance that I would lose my important British ally has stopped me from pulling the trigger. What idea groups are you guys taking? I took Exploration first, then Quality, then Expansion, and finally Trade. Local. I've account control turned off - could that be the problem? I had the same problem with Aragon and I definitely had neighboring provinces. I was conquering Grenada at the time. Once they had been assimilated I was able to fabricate the claim with no problems. Which turned out to be a huge mistake. Yeah. While a bit confusingly worded, that is the default message for disabled achievements. According to everything I've read, they are only supposed to be enabled if Ironman is enabled and you are using the single cloud save that Ironman mode automatically creates and you get to name at the beginning of your game. Local saves will turn off achievements and give you that message. Ah! That makes a weird kind of sense. So I'm beginning to get it. A little. Still not sure why I'm getting hammered in combat. I've a decent leader but unless I have 2-1 odds, I get wupped. While smooshing Grenada is easy, Aragon pounds me and even the rebels are better than I am. On my second start I waited until my peace agreement with Grenada ended before declaring war to avoid the instability hit (to avoid the rebels that smashed me (along with Aragon) in my first game) and by then Grenada had allied with Tripoli and Algiers, which made getting enough war score for full annexation really difficult. Then when I made peace I managed (somehow) to a "no changes" peace agreement which left my forces in all three provinces of Grenada but unable to re-declare war. Then Aragon pounded me. So in my third start last night, I jumped on Grenada immediately. That actually went really well - I LOVE the siege mechanism! Staged for an Aragon invasion, worked up a Causi Belli and invaded. I had three of his provinces and Navarro (one of his allies) under siege. All going well when suddenly armies he owned came out of the east and smacked me down. At the same time, three rebel armies popped up and that was all she wrote. So I'm getting there, but I must play closer attention to alliances and there's GOT to be something I'm missing in combat. You said that you were getting beaten in battles at the beginning of the game unless you had 2-1 odds even with a general. 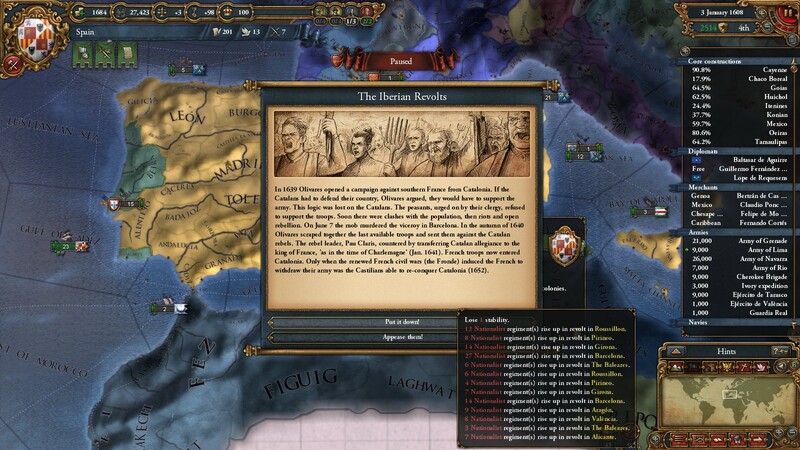 Since it is the beginning of the game and you are Castile, it is safe to assume that it isn't due to a tech disparity. Two things you should check. 1. Make sure that your army maintenance is turned all of the way up for a couple months pre-battle or you will be attacking with low morale 2. Be sure to check the terrain. Since you mentioned having difficulty getting chewed up versus Aragon, my guess would be #2. A lot of the provinces in Aragon have significant terrain bonuses for the defender because of mountains. Additionally, there are rivers running through there. Attacking across a river gives the defenders yet another bonus. When you are attacking look at the little boxes next to the dice rolls in the combat box in the lower left. There should be little pictures of the terrain with river and terrain modifiers down there to help give you some idea of what is going on. Edit: In game 2 where Tripoli and Algiers joined in, once you captured your stated objective (Grenada) the warscore will actually tick up over time even if you sit and do nothing. You just need to hold your objective. As it ticks up you can also individually contact lesser members of the alliance to see if they will leave early and make a separate peace with you. AND.... again but better this time. Only Aragon declared on me - apparently I'm scum. - and he had an alliance with England. I fought better but in the end they had a 17K army wandering around stomping on my 1s and 2s having trashed my stacks. I've good morale, but certainly have issues with the terrain. That may be part of it. Now I didn't know that! Yeah combat in EU4 greatly favors the defender, as far as I can see. However, I think with better tech this will change. Terrain modifiers appear to make more of a difference than they did in EU3 as well. Generals too. I started an England game. Damn, it's tough. 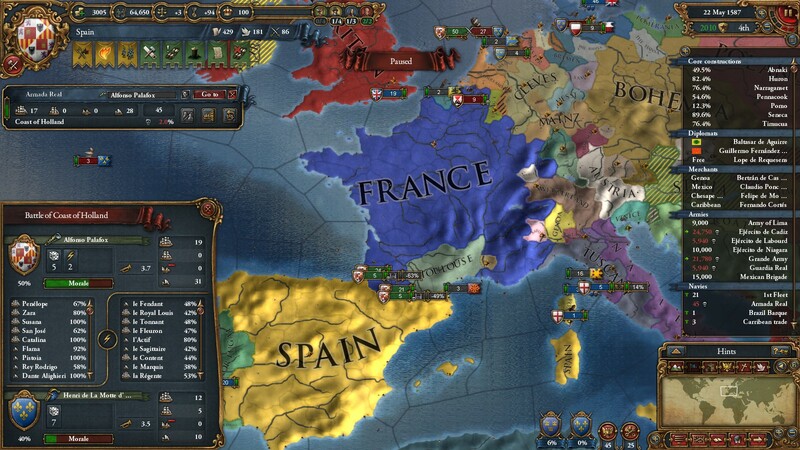 I immediately peaced out to France, giving them all the English provinces on the channel. Got Burgandy, Aragon, Portugal as allies but I am running very short on cash as I don't have the forcelimit to field a competitive army otherwise. I need allies but I keep getting called into their wars. I need a decade of peace to build up my cash reserves but it does not look like that will happen soon. Luckily, not too many rebellions in England (so far). How is this game compared to the learning curve of CK 2? Is it easier to get into? 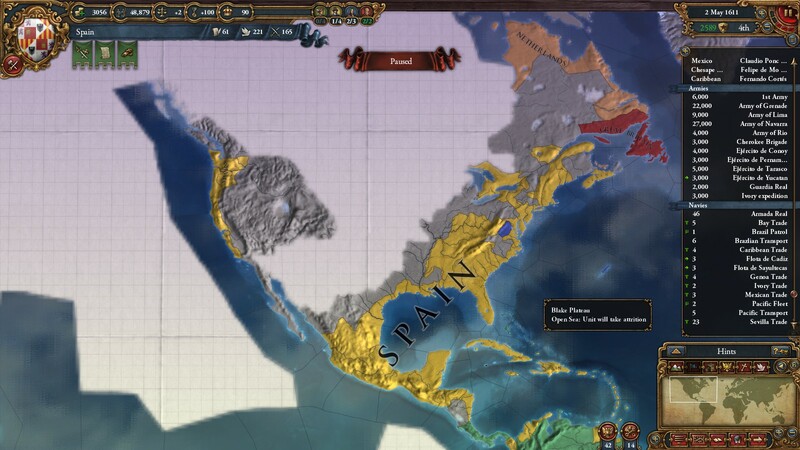 Nice job on the Spanish Empire! Looks like your next step will be to leverage those overseas holdings into a comfortable superiority over France in the continent. Thanks for the updates. As for ideas, in my England game I went Exploration, Quality, Economic, and Trade, in that order. How have you found going with the three Diplomatic ones? I see you have quite a stack of admin points sitting there, so maybe that's the answer right there. I would have loved to take Trade or Expansion earlier, but I felt that a balanced approach was all but required by the way monarch points end up working. If anything that lack of ability to specialize is one of the biggest things that makes me uneasy about the game so far. It actually works great from a gameplay perspective so I'm not too upset, but it is quite weird to me from an historical perspective that countries that choose to focus on a particular area (via ideas) are then essentially forced to lag behind in that area's technology race. I managed to win the 100 Years' War and enforce the personal union with France in my current game, but it was after a disastrous (and aborted) first attempt which saw me sitting at 0 manpower with rebels taking over the entire countryside. My biggest piece of advice when starting out as England is to, for the love of everything that is holy, appease the Lollards. There's simply no way for England to fight the substantial rebellions they bring and be in any shape to win a war at the same time. When fighting France you'll need a bit of luck, but you can help yourself out by being sure to call Portugal into the war right away. Aside from that, use your navy to concentrate what men you have and pick off stacks of French/French minors that you can handle. Maybe it was just a fluke, but I was able to drain France's manpower through this strategy and eventually got a total victory. I didn't use mercenaries myself, but they might be a good way to get a leg up in the manpower race. All in all, taking on France from the start date as England is an advanced challenge that ends up leading to a weird sort of game if you succeed. Anyone just starting out or looking for a normalish game shouldn't think twice about just peacing out. Mr. 0/0/0 gives you more than enough of a challenge to handle on his own. I'm trying to figure out how anyone could ever get any Administrative ideas. You need Admin levels to get new sets of ideas, and if you want Admin ideas, you need Admin points for those, too. Seems like I spend a lot of Admin points on buildings and stability, too. The balance seems a little off. I think it is more difficult. There's a lot more moving parts that you have to pay attention to in EU4 than in CK2. Congrats on the Hundred Years' War Gunner. Good advice on how to do it. In my England game I took Trade first then Quality. My next Idea will be Seapower(?) then Exploration. I am trying to play what I think of as a "traditional" English game: big on trade (and commensurate naval force), a small but high quality army, and late to the colonization game. We shall see how it works out. Damn, I thought they said it was easier to get in to. 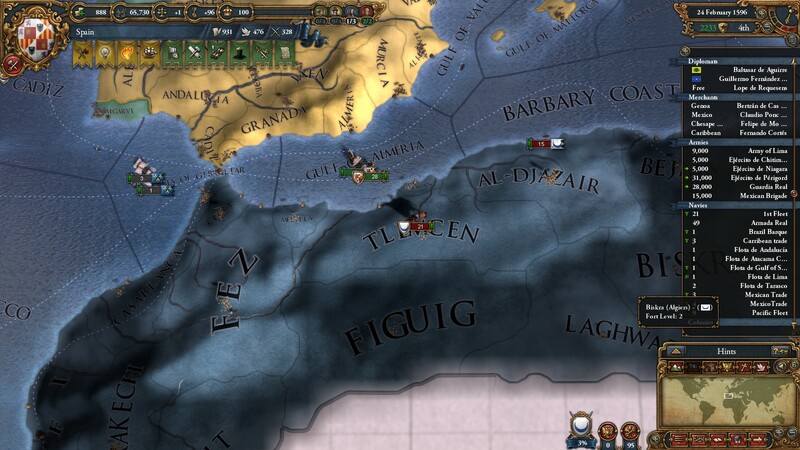 EU4 is the first 'grand strategy' game that I've ever played, and I'm finding it to be very approachable. However, I have played games like Civ in the past. The tutorials were quite helpful to me, in at least understanding the most basic elements of the game. There are still areas that I don't quite understand, particularly the trade system, and to a lesser extent the economy as a whole. There is a lot you have to pay attention to and it's easy to make mistakes, but I do think the game does a good job of giving you the information you need. There's probably also some really good Lets Play style tutorials on YouTube at this point, I'll probably look for some of those soon to fill in the gaps of what I haven't figured out. It's also possible that there's huge layers to the game that I'm completely unaware of, making it seem not as complicated as it is. So, while it definitely has a huge learning curve, don't let that scare you away if you are interested in the game. How do you setup a blockade? I can't seem to find any button to do so and right clicking on an enemy port doesn't seem to do anything. Move a fleet into the sea province adjacent to an enemy port. The port will will have a semi-circular "wall" next to it on the map showing that the port is blockaded. If there are multiple ports adjacent to the sea province, they will all be blockaded by the same fleet. From what I've seen you basically just need to have ANY type of fleet on the sea square touching the country you want to blockade. The enemy can move their fleet into the port for that country without having to fight your fleet, but the country will still be blockaded. If you ever have a question if you're blockading or not and you're at war, you can just hover the mouse over the warscore percentage in the warscore screen. It'll list any countries that you have blockaded there. Hotfix out today, which it looks like triggers the "you're running a mod so no achievements for you" message until you apply the patch. Then the massive wars started. While the last session was all about carefully planned wars of conquest to subjugate various native groups, all of the action this time around was unplanned and focused in Europe. Things started out simply enough in the mid-1580's with a call to arms from Great Britain. The British were trying to retake Meath and other Irish holdings that had previously slipped from their grasp. Unfortunately, the Irish were under the protection of the Swedes. As a dutiful ally, I responded to his call and shuttled 28K troops up to Ireland. As far as I was concerned, handling the Swedes was his problem, but I could use part of my European force to at least siege and take down the Irish. Within the year, my troops had vanquished the small Irish armies, occupied all three of the target provinces (Meath, Ulster, and Leinster), and were back on their ships headed home to Spain. Twelve months later, word was received from the border that Toulouse had declared war on France. At first, I shook my head and wondered to myself what they were thinking. However, intel (the ledger) sooned revealed what was going on. France still had 70,000 available manpower but only had 4000 troops. They had evidently suffered a major setback in northern Europe fighting against Bohemia and the Hansa. 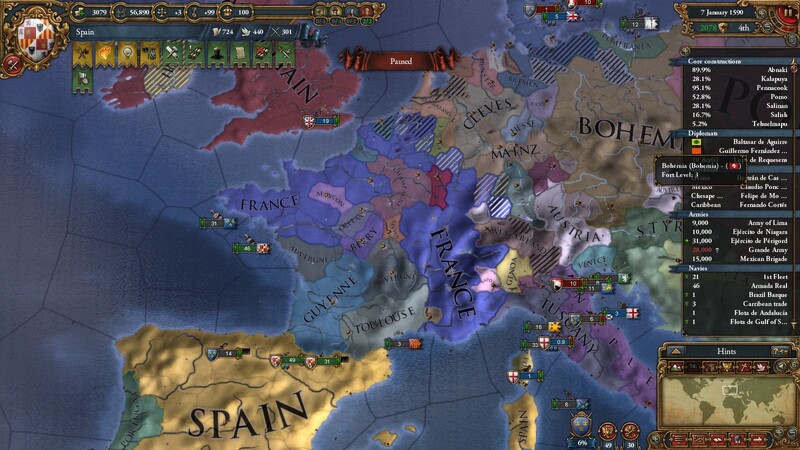 Toulouse, Austria, and a coalition of smaller HRE provinces had formed against France earlier in the game, and they chose this moment to strike. Seeing the wisdom in their attack, I moved my fleet north in search of the French fleet. Once I was in position, I declared war and attacked. As the two fleets duked it out, I marched 57K troops across the French border. France recovered and was able to field an army of 40K much more quickly than expected. Still, it was too little, too late to deal with three wars. By the war's end just three years later, France had been seriously reduced. In the aftermath, I allied with the newly freed kingdom of Guyenne. So far I haven't had any problems keeping up in the tech area because the early specialization on colonization and trade has provided me with the financial resources to hire any +3 advisors that show up. It also looks to be very, very expensive in point cost for any nation to get too far ahead because there are some pretty substantial "ahead of time" penalties to the point cost of the techs. Add in the negative neighbor bonuses, and I have been right there with France tech-wise. Though there was a time 50-60 years ago where I was ahead of France in admin and navy but 2 techs behind in military, now we are both 16-15-16. The only thing I would probably do differently would be to choose an admin idea instead of a diplo idea for that fourth slot. I made the choice of the the diplo because a) the ideas in that group were more beneficial to my game and b) my king and heir had big diplo #'s and my heir had a 0 in admin ability. Then I made my choice, and the ill heir event popped up about a year later. He died and my new heir had low diplo power but 6 in admin ability. My king died the next year and my admin points have been stacking up under the new king. Tech wise I am at 16-15-16 and have enough points to buy admin 17 and unlock another idea group, but I am putting it off a year or two so I do not have to pay as big of "ahead of time" tax on my admin points when I buy it. Has anyone else had difficulty getting screenshots to upload to the steam cloud? Since launch, my save game has been syncing to the cloud just fine but the pictures always fail out before they upload even though they upload to imgur without issue. I have problems uploading all the time. I turned off automatically uploading because it very seldom worked for me. Now I manually upload (which fails about 25% of the time but eventually succeeds after enough attempts). I have no idea about your other questions, which I am interested in knowing the answers to as well. I am back in work this week after a vacation, so will probably get some time to peruse the Paradox forums; certainly someone has done some analysis on this there by now. So my latest go around is going well. Rather than jumping straight into conflict, I worked on alliances instead. Allied with Portugal and Navarro and married into both families. I was angling to take Navarro by marriage. Meanwhile I started knocking off the easier missions. I was working on a Papal State likes me mission (get 190 positive approval) when Aragon jumped Navarro, pulling in his two allies Savoy and Naples. Coincidentally, Naples is next to the Papal State, so I was able to have them jump Naples, which kept them too busy to rush to the Iberian Peninsula. My fighting with Aragon went MUCH better, with me smashing all his armies and occupying all his provinces. Even the sea battles were going well, right up to the last one where he one and took all my heavy ships. Is that the gentle tug of a hook I feel? I played a lot of EU3, so my perspective may be off, but I think EU4 is easier to get into than CK2. Mechanically CK2 may be a bit more simple, but I find the idea of running a country and negotiating with other countries a much easier concept to grasp. Diplomatic actions seem to make more sense to me, too: you can form alliances at any time, etc. It takes awhile to understand Casus Belli and the ramifications of war, but I find that easier to get than how diplomatic relations work in CK2. I also think EU4's mission system helps give you very clear objectives to work towards, whereas in CK2 the only true objective was to have an heir (which itself was often confusing) and everything else was somewhat muddled in my mind. For some reason I always want to start EU by unifying Ireland. It's always a bad idea, though, because England is a pain to work with (or against). 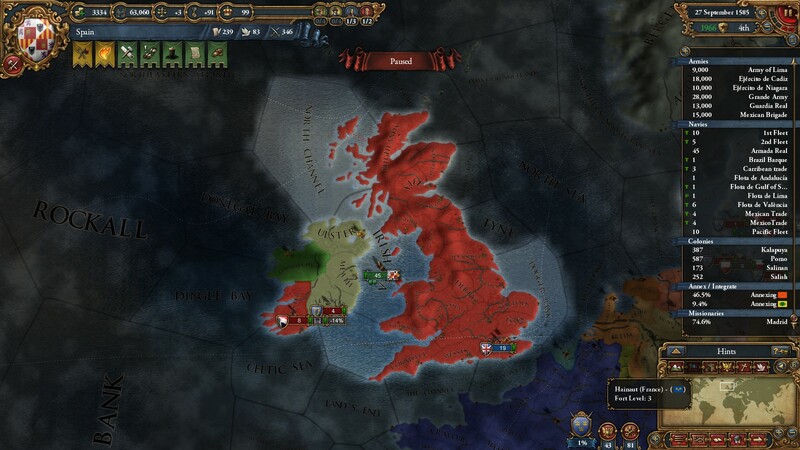 I was off to an extremely good start in my last game, then Scotland decided to pick a fight against England when nobody was really ready for it, including themselves. In hindsight I should've backed out of that war, but went ahead and things took a serious turn for the worse. 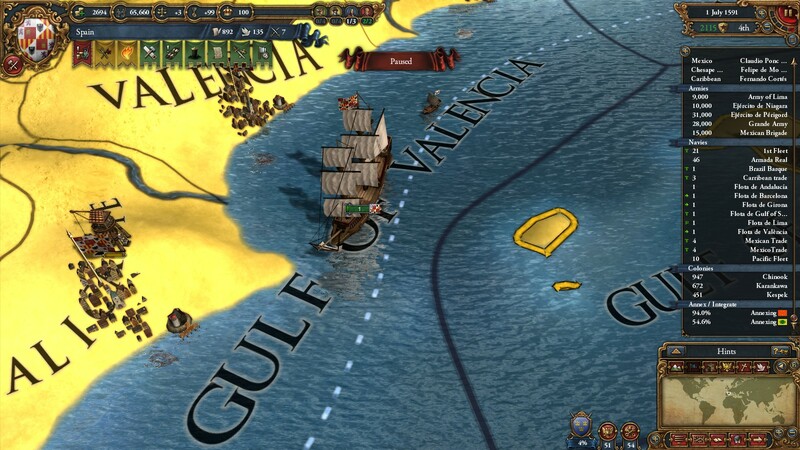 When I last left off with my story of Spain in 1591, the realm was happy and confident due to a recent victory over France and the launching of our first Galleon. That confidence extended into May 1592 when our attention turned back to the New World. First, Spain finally officially integrated the Cherokee nation, greatly increasing the size of its North American holdings. Second, the king decided that the time was right to launch another assault on the Aztecs. Once again, their faithful Incan allies joined, but neither force stood a chance against the majesty and power of Spain's colonial armies. By mid-1593 the native forces had once again been crushed. At the peace table, Spain claimed two gold producing territories from the Aztecs and forced them to release the Zapotec nation. From the Incas, Spain also annexed a gold producing territory and a second cheaper territory connecting the gold to our existing holdings. These conquests left the Spanish Empire severely overextended. So the King of Spain decided it would be best to regroup and consolidate the realm for the next several years. Unfortunately, the unruly populace had different plans in mind. Word had circulated throughout the realm that Spain was the rightful owner of the Algerian province of Sus. Such rumors often circulate and are usually easily ignored. Unfortunately, tales of the gold in Sus fired up the populace and unrest abruptly disrupted the stability of the realm. (stability drop for not acting on claim event) Faced with the threat of further unrest and stability loss, the Spanish king relented and ordered his armies to claim Sus for Spain. The Spanish military decided on a two pronged assault. The navy landed 28K men in Al-Djazair to secure the Algerian capital. Then it shuttled back to Spain to pick up a second army of 28K which it landed in Spain's African colonies. This second group would be tasked with marching north to capture and secure the province of Sus. Everything was going as planned and both seiges were underway when a herald from Guyenne arrived in 1597 seeking help in a war against France, Naples, Bourbanais, and Berry. Thinking that France was still weak and not thinking everything through the king readily agreed. Unfortunately, Guyenne took the lead in the war, and things started out poorly. The decision was made to finish capturing Sus and Al-Djazair, demand Sus in a peace settlement from Algiers, and then to shuttle the realm's armies into Guyenne to meet the French head to head. The plan didn't last long. Naples quickly invaded southern Italy with 12K men while 5K French colonial soldiers attacked Spanish African holdings from their Mali colonies to the south. Once Sus fell to the southern Spanish army, the 28K men there were divided. 10K men were tasked to march south and meet the French army in Africa while the other 18K were shipped to Italy to hold back the Neapolitans. Meanwhile, the siege of Al-Djazair continued. 1598 brought the fall Al-Djazair and a peace deal with Algiers in which Spain took the gold mines of Sus. The main Spanish army was then shipped out to Italy to help with the conquest and occupation of Naples. Neopolitan territory would be the bargaining chip the Spanish king would use to force the French out Guyenne. Meanwhile, things were also going well in French colonial Africa. After a series of running battles the Spanish forces had routed and destroyed the French colonials and were laying seige to multiple provinces in French West Africa. They even conquered and stole one of the French colonies in the area. In fact things were going so well that the Spanish king ordered a number of the troops in the African expedition to be shipped over to Brazil to secure some of the Brazilian French colonies. Despite the setback, Spain's armies were shipped into Europe in an attempt to save face and win the war. Things started well with sieges in Berry and Bourbon. The sieges withheld against large French counterattacks, but incurred horrific losses in manpower. Bourbon fell and the Spanish army there moved east into Charolais and began a siege. Berry fell and the rest of the Spanish army began marching across Bourbon to reinforce the Spanish in Charolais because of a large incoming French army. However, Guyenne's diplomacy once again wrecked Spanish strategy. Guyenne granted a separate white peace with the Bourbons delaying the arrival of Spanish relief forces. (My large army crossing Bourbon became black flagged and were unable to fight when they reached Charolais.) The French then trapped and utterly destroyed the large Spanish army besieging Charolais. The Spanish king was furious and had had enough. His reserve manpower was below 10K, and it felt like Guyenne had no interest in actually winning this war. The decision was made to obtain a white peace from France by giving up the territories we had occupied in French West Africa and Brazil while still keeping the two colonies Spain had seized outright. Just a quick note about seizing colonies. I think in the future I'll be more likely to simply burn them and recolonize than to seize them. If you seize them, then they give you overextension once they become provinces until you can core them. You also need access to core them, so I couldn't core the one in Africa until I also colonized the adjacent Ivory Coast. Luckily "occupying" an adjacent province also seems to work. and I was able to start the coring process on the Brazilian colony I seized while I was occupying its provincial neighbor during the war. Otherwise, I would be stuck with its overextension and with no way to core. After the humiliation of the latest Spanish-French war, Spain's army commanders decided to lift the king's spirits by launching a glorious war to conquer what was left of the Aztecs. It went much more smoothly than the war in France, and the last three Aztec provinces were taken with little loss of life. Only a couple years later what was left of the Zapotec nation was also conquered and brought under Spanish control in 1607. By 1611, Spanish diplomats and bureaucrats had also completed integration of the Iroquois into the Spanish nation. North America 1611-Mexico has been conquered, the Maya and Iroquois have been integrated, and we have some new colonial neighbors. While Spain's new world empire had been thriving, things were coming undone in the Spanish homeland. The loss of manpower and pride in the war against France had bubbled over into outright rebellion among those in Catalonia. Instead of fighting and slaughtering the roughly 130K catalan nationalists that were threatening to rise up, the king gave into their demands and lost all trade, production, and taxes from the region for an entire decade. Thankfully, the Cheasapeake and Caribbean trade had become such an overwhelmingly large part of the economy that the country was able to financially handle this burden. You don't want this event. I think they are seriously pissed. I chickened out and appeased them. My game is proceeding nicely. Castille is still slowly expanding in Europe. Tech levels are increasing - finally got a decent Monarch! - and I've even got my first Ideas - colonization and exploration. I find it amusingly frustrating that you get a colonist BEFORE explorers/conquistadors. Which meant I could do nothing before I ground my way up to another 400 diplomacy. My first foray into the new world was a disaster. I whipped up a small expeditionary force - 3 heavies lead by an explorer and 6 ground-pounders led by a Conquistador - and sent them over the big blue. They made landfall in Trinidad of the Winward Islands. It was then that I learnt that I couldn't colonize as my colonization reach is 150 miles (WTF?) and then all my ships, with troops aboard, died through attrition. I guess there's more learning needed. Now it looks like I'm going to have to get the Canaries back from Algiers in order to expand along the African west coast. 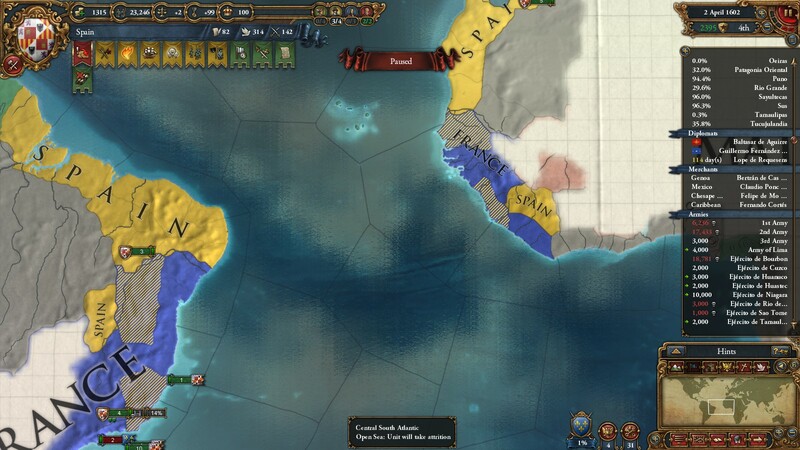 I find it amusingly frustrating that you get a colonist BEFORE explorers/conquistadors. I sent mine to colonize parts of Africa. I am always willing to answer folks' questions, either here or via Steam chat, although it looks like Jasonofindy is way ahead of me on understanding the game. For some reason, I am struggling getting up to speed on how this game works. So many things have changed since EU3, but I am enjoying the learning curve a lot.